Villa Montale Historical Mansion is a prestigious mansion, pure Art deco’ style, built up in the late 1880’s. This Monterosso holiday villa represents a historical landmark, since it belonged to the Nobel price for literature (1975) Eugenio Montale, who, in this amazing property lived and composed some of his marvellous poems. 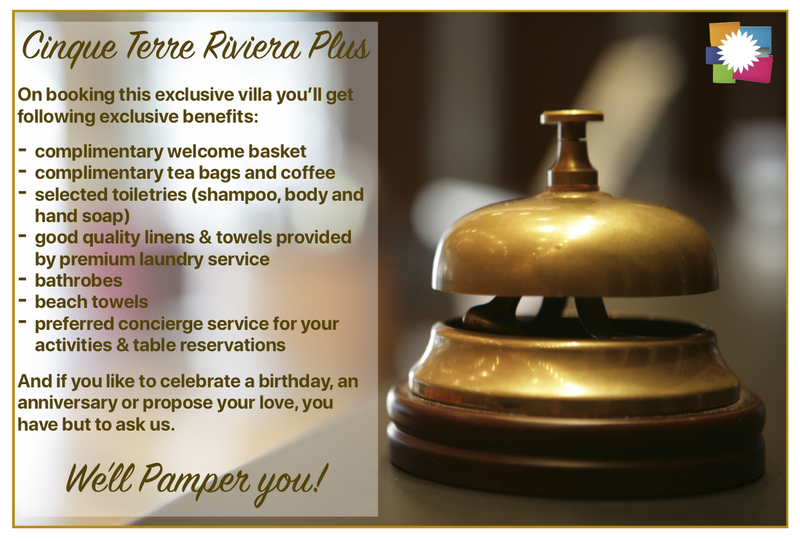 Cinque Terre Riviera rents in this villa just an exclusive, the luxury, large and elegant apartment on the first floor. The building is positioned on top of a small hill in the western part of Monterosso, Fegina, just a few steps from its famous village beaches. Visiting the house it is evident that quietness and beauty that inspired the poet are still here: from its windows the relaxing view of the sea is definitely part of the fascinating atmosphere of Villa Montale and the big park of palms and pine trees, embracing the property, is a real treasure of silence and beauty offering shade to the mansion and keeping it fresh even in the hottest months. The whole villa is now divided into three apartments (one each floor) belonging to three different private owners. 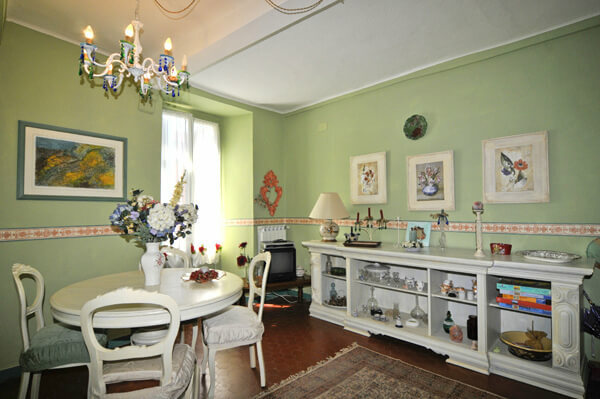 The apartment “I Limoni”, available for rental, is located on second floor. On entering from the main door we find a spacious entrance hall from where we reach the majestic sitting and dining room that will reveal incredible fresco’s paintings, a peculiarity of all the bedrooms of the apartment. In this room two big windows, one leading to a small balcony. Both of them open on the amazing panorama of the sea and the luxuriant park of the villa, with its tall, century old palm trees. The floor is made following the Ligurian technique of “graniglia”, or “Tappeto Genovese” (Genoese Carpet), a classic and elegant decoration typical of the high class Genoese families mansions during the 1800 and early 1900. Two comfortable sofas and a large table for up to 10 seats are perfect for having a delicious dinner or just for enjoying the quietness of the place. This large dining and sitting room is the real heart of the house and from it we have access to the rest of the apartment, including five bedrooms (four double and one twin), three luxury bathrooms with showers, renovated in 2018, and a kitchen. There’s no air conditioning at this villa, but definitely there’s no need for it, being the villa in shaded and ventilated area, cool even in the hot season. 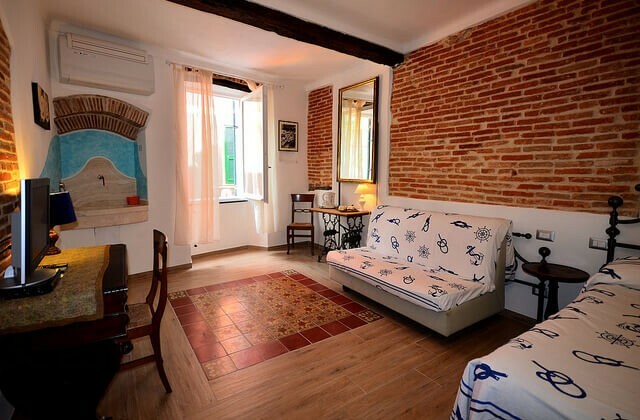 There are five bedrooms in the Villa Montale Apartment I Limoni. All of them are comfortable and charming, each one is decorated with a different color. Two of the double rooms have views of the sea. The other bedrooms (two doubles, one twin) have views of a serene park filled with beautiful pine trees where the poet Montale used to seat and get inspiration for his lines. One of the bedrooms has a small en-suite bathroom. The kitchen, fully equipped is typical of the Ligurian mansions of the XIX Century, even though furnishing and equipement is entirely new. In the kitchen we have: gas stove and oven, microwave oven, dishwasher and washing machine, toaster, tea and coffee boiler, Italian and American coffee maker. There are three luxury bathrooms with shower entirely renovated in 2018. Each one is equipped with hairdryer. Guests can have access to the garden of the villa provided they have respect for condo rules, privacy and quietness of the owners of the other apartments. Parties and dinners are not allowed (unless through previous approval from the building management), but all those who want to indulge quietly reading a book, painting or drinking a glass of delicious Cinque terre wine are more than welcome. A part of the garden with tables and chairs are dedicated to Villa Montale Apartment I Limoni Guests. Property is ideal for family reunions and special services such as Chef-at-Home or amazing Cooking Classes can be offered at this villa. 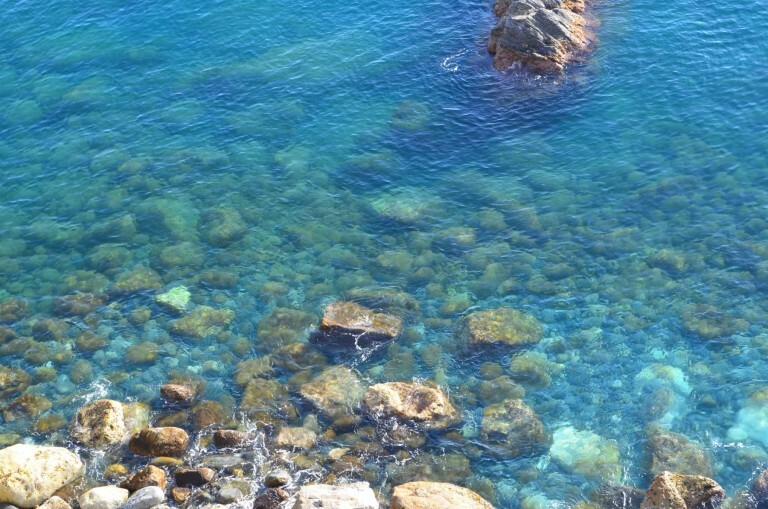 Everything is at hand, specially the amazing beaches of Monterosso! Cinque Terre Riviera can also organise for Villa Montale guests fantastic boat trips and private tours. On choosing Villa Montale Historical Mansion, you may need to plan private transfers: we can send our Drivers Company to pick you up at any airport, train station or Italian town your trip may include. Villa Montale Apartment I Limoni will go under bathroom renovation in January 2018. We’ll publish new pictures immediately after. The property will remain closed for the entire month of January.